Efforts by the Egyptian military and security forces to exploit Wednesday’s soccer violence in Port Said in which 74 people were killed in the worst violence in the country’s football history threaten to back fire with mounting indications that authorities should have been aware of plans to disrupt the match between the city’s Al Masri SC and crowned Cairo club Al Ahli SC. A series of messages on Twitter in advance of the match between the two rivals, whose fans already clashed last June in Port Said, as well as analysis by soccer officials of video of Wednesday’s incident is sparking outrage among Egyptians who have not in the past supported the country’s militant, highly politicized, violence-prone soccer fans or ultras. The security forces’ low level presence in the Port Stadium, part of an effort in the past year by the unpopular police forces, which are widely seen as the henchmen of ousted President Hosni Mubarak’s regime, to avoid clashes with the ultras – founded by professionals and students who often were anarchists who modelled themselves on similar groups in Serbia and Italy -- and are credited for their role last year in Egypt’s anti-government revolt, was also designed to demonstrate that the police was needed to prevent a breakdown of law and order. Many Egyptians are convinced that in the case of Port Said, the police’s attitude was backed by the country’s military rulers in a bid to further drive a wedge between the militant groups, the most radical opponents of continued military rule, and a protest-weary public that still has confidence in the military despite its brutal crackdown on protesters, is frustrated by the lack of tangible economic benefit from the revolt and wants a return to normalcy so that Egypt can resume economic growth. Whether that strategy will work could be put to the test on Friday when it will become clear what kind of response the ultras are getting to their calls for a protest march on the interior minister. The sense that the police and the military failed to live up to their responsibilities in Port Said and that the violence was not spontaneous could work in the ultras favour. “There was something planned. Our security knew about it. People were tweeting before the match. I saw a tweet with my own eyes 13 to 14 hours before the match in which a Masri fan was telling Ahli supporters: ‘If you are coming to the match, write your will before you come,” said Diaa Salah, a member of the women’s committee of the Egyptian Football Federation (EFA) whose board consists of Mubarak appointees, and a former manager of a soccer club. “The government is getting back at the ultras. They are saying: ‘You protest against us, you want democracy and freedom. Here is a taste of your democracy and freedom,” Mr. Salah said. Ultras of Al Ahli, a club founded more than a century ago as a center of anti-British, republican nationalism together with supporters of their arch Cairo rival Al Zamalek, the club created by British colonial administrators, their Egyptian allies and monarchists, set their deep-seated hatred of one another aside in the past year to join forces first against Mubarak and then against the military. The ultras played a key role in breaking the barrier of fear that had prevented Egyptians from en masse protesting against the government and formed the outer defence line on Tahrir Square last year against the security forces and Mubarak loyalists. Ultras were since in the lead in the storming of the offices of Mubarak’s hated State Security Service shortly after his departure, repeated clashes with security forces in the stadiums, the storming of the Israeli embassy in September and finally the vicious battles in November and December in streets near Tahrir Square in which more than 50 people were killed and more than a 1,000 were wounded. Those battles were in demand of the immediate return of the military to its barracks. The ultras’ fearlessness coupled with their record of years of hostility towards the police increasingly drew thousands of disaffected, less educated and often unemployed youth whose political thinking was less sharply defined and who bear a deep-seated grudge against the police for the violence and abuse they suffered in years of clashes in the stadiums. Ultras last April in the first African club championship in Cairo in which the public was freely admitted between Zamalek and Esperance Sportieve du Tunis stormed the pitch in the 90th minute destroying everything in their path. Leaders of the ultras admitted at the time that they were losing control to a charismatic young man with no education and no job. 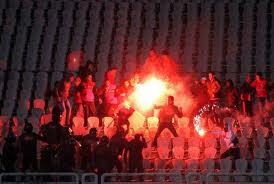 In a clear indication that leaders of both the Ahly and Zamalek ultras were seeking to curb violence, Ultras White Knights (UWK), the Zamalek support group called in a statement several days before the match in Port Said and in advance of an Al Ahly-Zamalek match that had been scheduled for February 8 on their Al Ahly counterparts to agree on a truce. “We are asking for an end to the bloodshed and to reconcile and unite for the sake of Egypt,” the UWK said. Ultras Ahlawy replied with a smiley. That call is now more relevant than ever. The ultras whether they walked into a trap or initiated the Port Said violence have no doubt again dug themselves into a hole. This time round it will be a lot tougher to dig themselves out. They have played into the hands of the military and the police in dealing a lethal blow contentious street politics as opposed to electoral politics and the horse trading associated with it. For those who believe that only continued protests will ensure Egypt’s transition to a democracy and prevent remnants of the ancien regime and established opposition forces such as the Muslim Brotherhood from filling the political vacuum and structuring the country’s future in a way that serves their interests rather than one that guarantees the emergence of a full-fledged democracy, Wednesday is a black day.